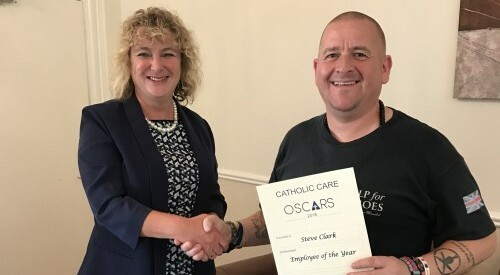 Over 100 staff and employees gathered expectantly in the Hotel Metropole in Leeds for the 3rd Catholic Care Oscars, an evening to recognise and celebrate achievements of staff and volunteers, and nobody was disappointed. 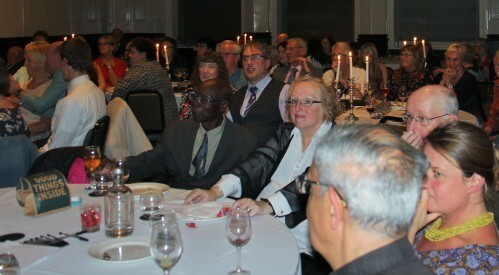 The room was buzzing with excitement and anticipation as guests tucked into a sumptuous buffet and the wine flowed. 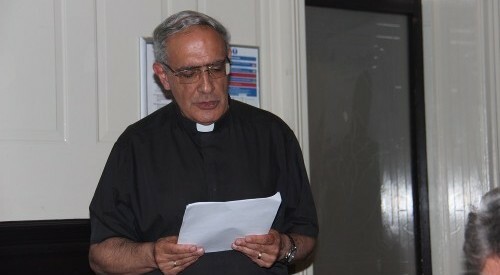 Deacon Joe Cortis, a Trustee of Catholic Care, started proceedings with a short gospel reading reminding us all to use our talents. 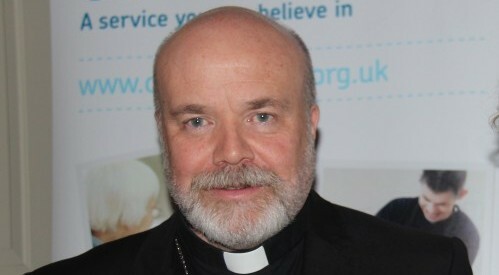 Bishop Marcus, who had joined the celebrations for a short time before flying off to Rome, thanked all staff and volunteers emphasising that their dedication and commitment really did reach out to those in need and made such a positive difference to their lives. Before the awards were presented staff and volunteers from new services were recognised. 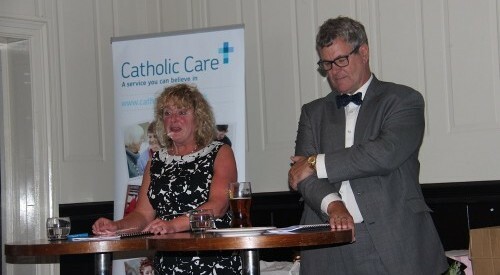 Carol Hill (Director of Catholic Care) who presented the evening with Tim Parr (Trustee) said the past 18 months had seen “an evolution in new services at Catholic Care, particularly those services delivered in the community” . She went onto say that this is only possible with our “ever creative staff and volunteers who are crucial to this community work”. The first award of the evening was in recognition of staff who had achieved 100% attendance in the period October 2016 to August 2018. 49 members of staff qualified for this award representing well over 1/3 of our entire workforce. Continuity of staff is so important to the highest level of quality care being given to those people we provide a service to. Our next category of award was for those who had received a recognised qualification in the past 2 years. This includes Level 3 and 5 Diplomas for care staff and Practice Educator and ASYE awards for social workers. Twelve awards were presented here. Sometimes we have to say goodbye to our friends and colleagues as they start a new chapter in their lives and retire. 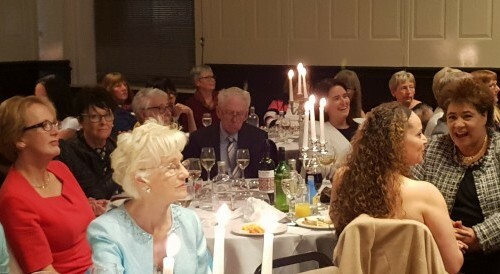 On the evening two colleagues were recognised – Kath Green who had served the Charity faithfully for 40 years, joining as a nursery nurse in 1978 and ending her time supporting adults with a learning disability. 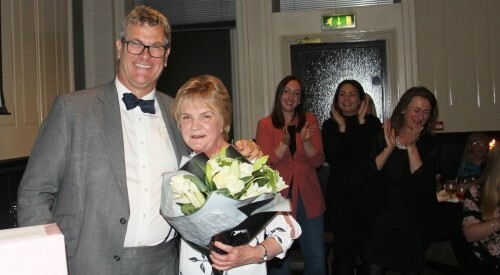 And Kathleen Ireland who will be much missed for welcoming and friendly disposition after 17 years as catholic Care’s head office receptionist. Three awards were made for long service in recognition of those members of staff who have served the Charity for 25 years. The first to be recognised was Tracey Burke who has worked all her life supporting children and young people is currently the Deputy Manager at the Leeds Residential Children’s Home. Second was Maureen Lockwood who throughout her 25 years has worked in nearly all major areas of the Charity, children’s homes, our mental health service and homes for adults with a learning disability where she currently works in Bingley. 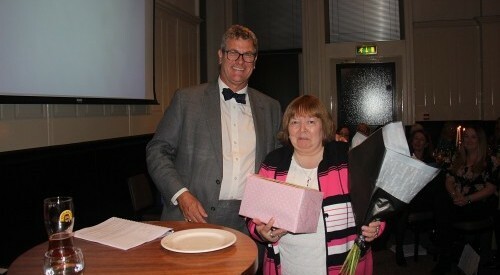 Finally Janet Flynn was recognised for her long service. Janet is the Charity’s HR person and is known to all by name and voice if not by face. Our awards then moved on to Teams of the Year. First it was the award for Adult Services. There were 2 nominations in the category: the staff team at Templegate supported living home for adults with a learning disability and the staff team at Westhaven Residential Home for adults with a learning disability. When we care for an adult with a learning disability it is a long term commitment, we care for them for life. Some of the people we care for have been in our care for 25 years or more. But like us all they age and this brings complexities and change. Both staff teams had been faced with similar circumstances in that one of their long term people they care for was living with an advanced aging process. Both staff teams were however undeterred and they continue to be inspirational and dedicated throughout. It was impossible to select one winner and therefor both staff teams were awarded Team of the Year (Adult Services). Our next Team of the Year award was for Children’s Services. Our Charity has a long history of caring for children and young people, but this year two of our newer projects were recognised. The nominations were for the team who have established the Young Carers Project and the team who set up the Holiday Hunger Project. Again it was impossible to choose a winner as both team had contributed such an enormous amount to children, young people and their families in a relatively short space of time and therefore both tams were awarded Team of the Year (Children’s Services). They couldn’t all be winners and the awards were made to the stay & play Group from Normanton and the lunch club at St Williams. There could only be one winner this time and when Tim Parr opened the all important envelope the congratulations wert to Ray Fishburn. Matt Stewart who is a Senior Support Worker within our adult learning disability service. Matt wholeheartedly cares for those in his care, he just wants the very best for them. On his days off Matt has decorated the house so that the people supported there really do have a home to be proud of. Sharon Wicks who is a Social Worker within the School’s, Children & Family Wellbeing Service. Sharon took the Holiday Hunger project to heart and ensured its streamlined delivery reaching out to those children and their families most in need. Again when Tim opened up the envelope the winner of Employee of the Year was revealed at Steve Clarke, Deputy Manager at the House of Light Residential Home for adults with a learning disability. Steve’s dedication to his role knows no bounds; always putting the needs of the residents first and going the extra mile to ensure they enjoy life to the full as shown by this summers adventures. Steve is often described as “Action Man” undertaking many maintenance jobs and keeping the organisation in line with his H&S training. The evening ended with a bit of fun. There is always a first time for everything and one of our social workers, Graham Robertson, was introduced to a giant water slide whilst out on an outward bounds days with the young carers. If only he could have shouted I’m a Social Worker Get Me Out of Here! Congratulations to all those receiving nominations and awards.